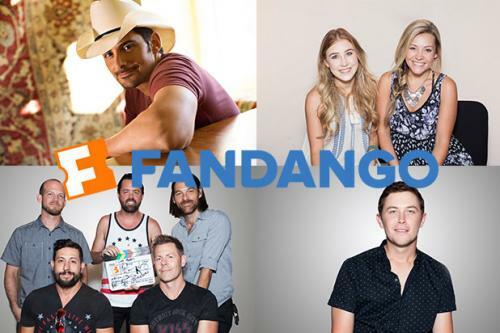 Fandango Movieclips, the number one destination for movie trailers and movie-related video content on YouTube, launched today a Country Edition of its “I Love Movies” original video series, featuring four new episodes with Country Music stars Brad Paisley, Scotty McCreery, Maddie & Tae, and Old Dominion. The episodes, filmed on location at CMA Music Festival in Nashville earlier this summer, are available now for viewing on Fandango Movieclips on YouTube and Fandango.com. “I Love Movies” celebrates the joys of moviegoing and showcases celebrities and other cultural influencers across the globe, sharing personal stories and introducing fans to the movies that have touched their lives. Previous episodes of “I Love Movies,” have featured NBA All-Star Dwight Howard, Grammy Award winner Reba McEntire, skateboarding icon and X Games gold medalist Tony Hawk, five-time heavyweight champion Evander Holyfield, rock legend Slash and Country Music artist Darius Rucker, talking about iconic movies like “Rocky,” “The Sound of Music,” “Finding Nemo,” “The Spy Who Loved Me,” “The Naked Gun,” “Purple Rain,” and “The Exorcist,” so that fans can learn about these movies and their impact. Interviews for “I Love Movies” were conducted by New York Times bestselling author and writer-at-large for Esquire Magazine, Cal Fussman. Brad Paisley is a critically acclaimed singer, songwriter, guitarist and entertainer whose talents have earned him numerous awards, including three GRAMMYs, two American Music Awards, and 14 CMA Awards (including Entertainer of the Year), among many others. He has been a proud member of the Grand Ole Opry since 2001. Paisley has written or co-written 20 of his 23 No. 1 singles with the first being his 1999 hit “He Didn’t Have To Be” and his most recent, “Perfect Storm,” from his chart topping 2014 album Moonshine in the Trunk. Paisley’s current single is “Crushin’ It” from the same album, and he kicked off his CRUSHIN’ IT WORLD TOUR the middle of May by playing to over 50,000 fans the first weekend. Scotty McCreery burst onto the national music scene in 2011 at age 17 and has quickly established himself as one of Country Music’s hottest new stars. By age 21, the singer/songwriter has sold nearly 2.5 million albums, debuting three consecutive albums at No. 1 on a Billboard chart. In 2011, after winning season 10 of “American Idol,” McCreery released his debut album, the Platinum-certified Clear As Day, which made him both the first Country artist and the youngest male artist to debut their first studio album at No. 1 on the Billboard Top 200 Albums chart. His 2013 album See You Tonight, debuted at No. 1 on the Billboard Top Country Albums chart and featured his recent Top Ten hits “Feelin’ It” and the title song. He has also achieved three Platinum-certified singles: “I Love You This Big,” “The Trouble with Girls,” and “See You Tonight.” McCreery is currently on tour with Rascal Flatts on their RIOT TOUR 2015 this summer, in addition to doing solo dates throughout the year, and will be releasing new music soon. Fast rising female act, Maddie & Tae introduced their debut single “Girl In A Country Song,” earning a No. 1 spot on Country radio, Gold-certification, and over 25 million views on VEVO. They are only the third female duo to peak their debut single at No. 1, in the history of the Billboard Country Singles chart. The girls from Texas and Oklahoma, respectively, most recently topped Nashville Scene’s Annual Country Critics’ Poll for Single of The Year and will release their new album Start Here, on August 28 from Dot Records. The duo’s Grand Ole Opry debut earned kudos from Opry member Brad Paisley. Maddie & Tae are currently on the road for Dierks Bentley’s SOUNDS OF SUMMER TOUR and will be headlining the START HERE TOUR this fall. One of the hottest bands in Country Music, Old Dominion is comprised of lead singer Matthew Ramsey, multi-instrumentalist Trevor Rosen, drummer Whit Sellers, bassist Geoff Sprung and lead guitarist Brad Tursi. Their single “Break Up With Him” currently ranks in the Top 30 on the Country charts and spent six weeks at No. 1 on SiriusXM’s The Highway Hot 45 Countdown. The band is currently touring with Kenny Chesney on THE BIG REVIVAL TOUR for 18 stadiums this summer, and has previously toured with Chase Rice on his IGNITE THE NIGHT TOUR and this past spring with Eli Young Band. Billboard, Huffington Post, Nashville Lifestyles, Rolling Stone Country, Spotify and others have included Old Dominion on their 2015 watch lists. Hosted by reigning CMA Vocal Group of the Year Little Big Town who is returning for the third time to host the summer’s hottest television music event, “CMA Music Festival: Country’s Night to Rock” airs on Tuesday, August 4 8|7c on the ABC television network. “CMA Music Festival: Country’s Night to Rock” is executive-produced by Robert Deaton. Filmed during CMA Music Festival in June, the special features many of today’s most exciting Country Music stars, including Jason Aldean, Dierks Bentley, Lee Brice, Luke Bryan, Kenny Chesney, Eric Church, Brett Eldredge, Florida Georgia Line, Randy Houser, Sam Hunt, Lady Antebellum, Little Big Town, Maddie & Tae, Kip Moore, Brad Paisley, Rascal Flatts, Thomas Rhett, Darius Rucker, Cole Swindell, Carrie Underwood, Keith Urban, Chris Young, and Zac Brown Band as they hit the stage during the four-day party and celebration of America’s music. Fandango, the nation’s leading moviegoer destination, sells tickets to more than 26,000 screens nationwide. Fandango entertains and informs consumers with reviews, commentary, celebrity interviews and trailers, and offers the ability to quickly select a film, plan where and when to see it, and conveniently buy tickets in advance. For many theaters, fans can print their tickets at home or receive them as a paperless Mobile Ticket on their smartphones. Fandango’s top-ranking movie ticketing apps, with 46 million downloads, are available on the iPhone and iPad, Android, and many other platforms. Fandango is enjoyed by more than 36 million online and mobile visitors each month, according to comScore. Film fans also find Fandango on Facebook at www.facebook.com/fandango and on Twitter@Fandango. Founded in 1958, the Country Music Association was the first trade organization formed to promote a type of music. In 1961, CMA created the Country Music Hall of Fame to recognize artists and industry professionals with Country Music’s highest honor. More than 7,400 music industry professionals and companies from around the globe are members of CMA. The organization’s objectives are to serve as an educational and professional resource for the industry and advance the growth of Country Music around the world. This is accomplished through CMA’s core initiatives: the CMA Awards, which annually recognize outstanding achievement in the industry; the CMA Music Festival, which benefits music education and is taped for a three-hour TV special; and “CMA Country Christmas,” featuring Country artists performing original music and Christmas classics. All of CMA’s television properties will air on the ABC Television network through 2021.